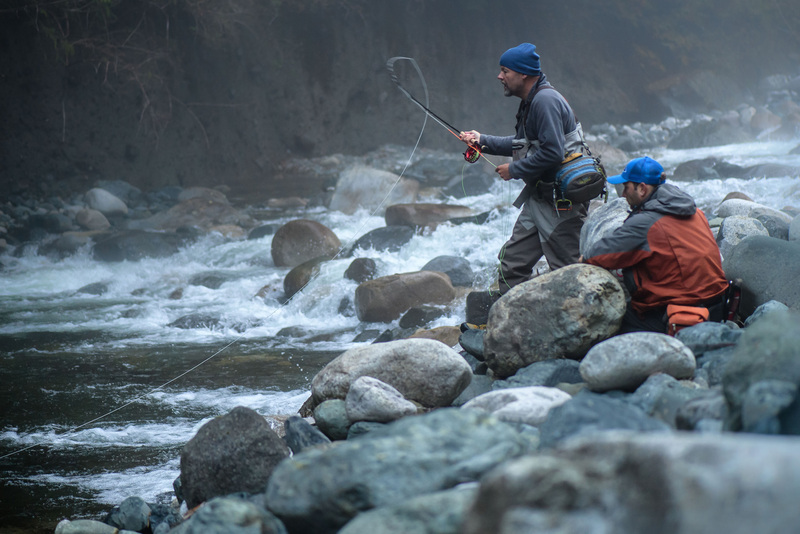 From the last week of July to the middle of November the rivers of the Campbell River and other remote Vancouver Island streams are teaming with one or more of the 5 pacific Salmon species. It is not uncommon to hook many Salmon in a day of fly fishing. 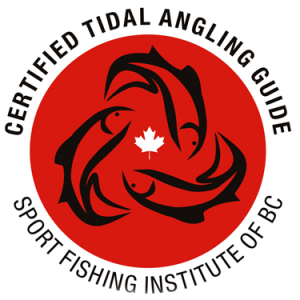 Call us for details of the species you would like to target, and we will set you up with the best dates for campbell river Salmon fly fishing. We offer all methods of fishing for Vancouver Island Salmon. We often float in our river raft, as well as walk and wade trips with methods such as spin fishing, float fishing, gear fishing, trotting and more. We always suggest the most productive type of fishing for the time that you are here, but will accommodate your wishes for certain methods as well. 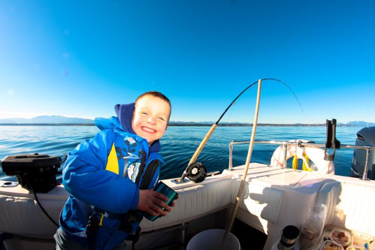 We want you to enjoy our Vancouver Island Salmon in any way possible, and our Campbell River fishing guides are well versed and skilled at all local methods of fishing for Vancouver Island Salmon to ensure your success. Pacific Salmon cruise the shorline and estuaries surrounding the Campbell River area from mid August to mid October, before they begin to enter their native rivers along the coast. 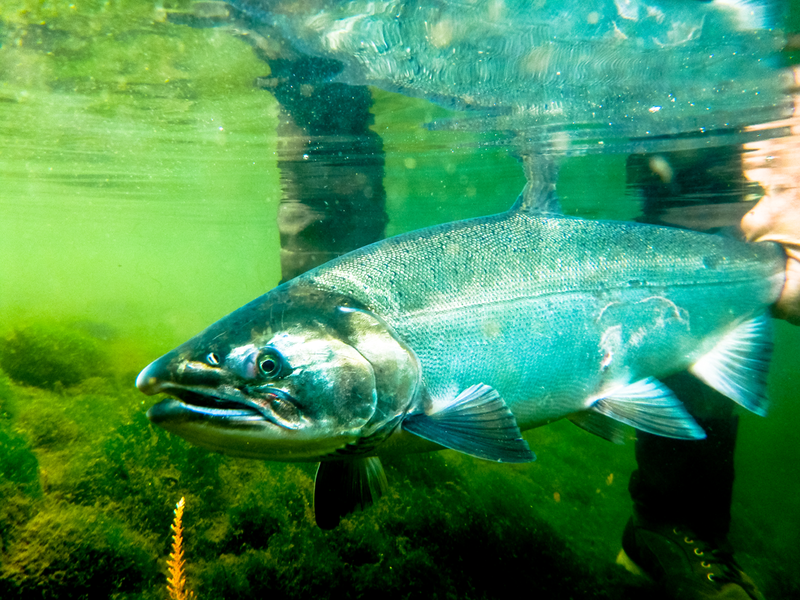 While cruising, these salmon are voraciously feeding. This provides excellent opportunity to hook one of these aggressive fish on a fly. 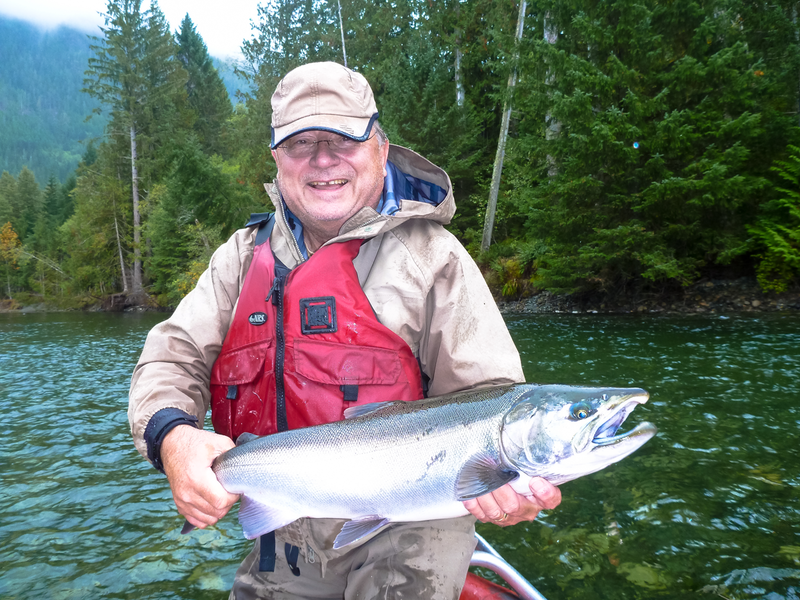 Whether from shore, in one of our pontoon boats or from our anchored boat, our Campbell River salmon fly fishing guides will get you to where the salmon are. For the dry fly and nymph enthusiast, we offer spring trips for Rainbows in small island streams. These rainbows are extremetly aggressive on drys and nymphs. 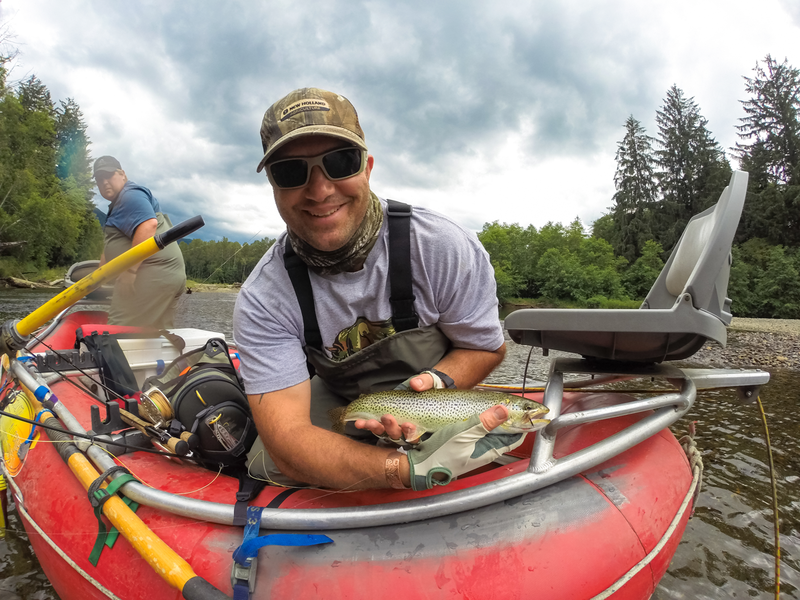 One of the challenging yet rewarding types of fishing is sea-run cutthroat fishing. These stealth fish cruise the beaches and estuaries around the Campbell River area, in search of salmon fry. Realistic presentations turn these wild fish into aggressive feeders if you can stay on top of them!! Beginning in April, the lakes in the Campbell River area start to turn on! Imagine the subtle feeling of your line tightening up as a fish sips your fly… then as it explodes into action on a light fly rod… There is nothing like early season lake fishing! We have many local lakes abundant with fish, and a handfull of remote fly-in lakes that we can access via our unforgettable Lake Heli-fishing trips. Campbell River fishing trip and Campbell River fishing Charters!